GHOSTBUSTERS (1984); Dir. Ivan Reitman; Starring Bill Murray, Dan Aykroyd, Harold Ramis, Ernie Hudson, Sigourney Weaver, Rick Moranis and Annie Potts; August 2 & 3 @ Midnight; Landmark Midtown Art Cinema; Tickets here; Trailer here. Midnight Madness has descended upon the Landmark Midtown Art Cinema! This time, they’re bringing you one of the greatest comedies of the 1980s, the spook-stravaganza, GHOSTBUSTERS! Sometimes you need a film that challenges your belief system. Sometimes you need a film that will rouse you to action. Sometimes you need a film that makes you ask tough questions about the world we live in. And sometimes you just need a film that’s only out to entertain you in the biggest possible way. Few films accomplish this like GHOSTBUSTERS. 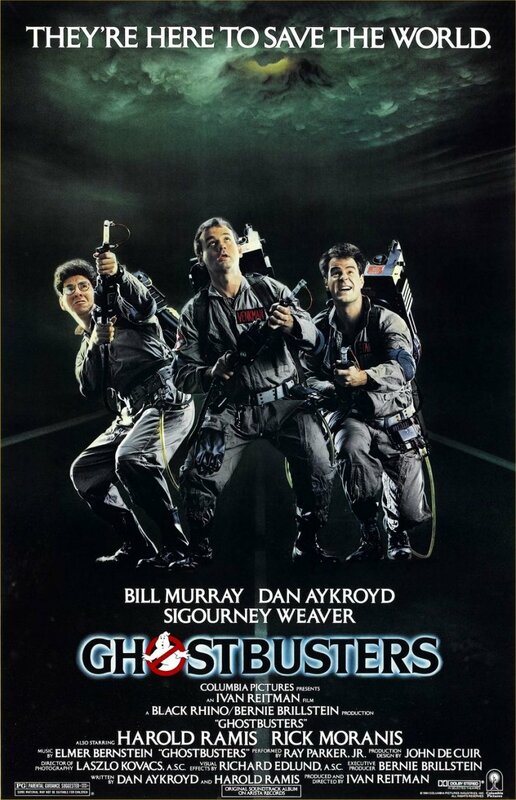 Three New York City parapsychologists—Peter Venkman (Bill Murray), Raymond Stanz (Dan Aykroyd) and Egon Spengler (Harold Ramis)—after being kicked out of their tony Columbia University gigs, decide to monetize their research by setting up a “ghost extermination” service out of an old firehouse. Business is slow, but a successful capture at the Sedgewick Hotel leads to huge demand for their services and rock-star status in the city. Meanwhile, they are hired by Dana Barrett (Sigourney Weaver), whose apartment is being haunted by a entity known as Zuul. Her neighbor, Louis Tully (Rick Moranis), becomes possessed by Zuul’s companion demigod, Vinz Clortho. That would be bad enough, but the arrival of these two beings on this plane, along with the rise in supernatural phenomena, signals the coming destruction of this planet at the hands of Sumerian deity Gozer the Gozerian. Assisted by new hire Winston Zeddemore (Ernie Hudson), the team must try to find a way to stop the apocalyptic plans of Gozer and round up the hordes of suddenly-freed spirits plaguing NYC. Yeah, I know. It reads as incredibly complicated and far-fetched, and peppered with names that sound ripped from some late-night Dungeons & Dragons campaign. But frankly, none of this matters because all this mythological-sounding hoosafudge is just there to be in service to the kind of inspired, wacky comedy that was the stock-in-trade of Dan Aykroyd, Harold Ramis and Bill Murray at the time. Sure, it’s a movie about ghosts, but there’s no sentimentality in their treatment of them (unlike, say, Peter Jackson’s similarly-themed THE FRIGHTENERS) and not even any real fright involved in their treatment. The ghosts on parade are rarely even remotely spooky: they’re just neon-green-colored pranksters for the most part. And even the agent of the ultimate destruction of humankind gets played for laughs at the very end. 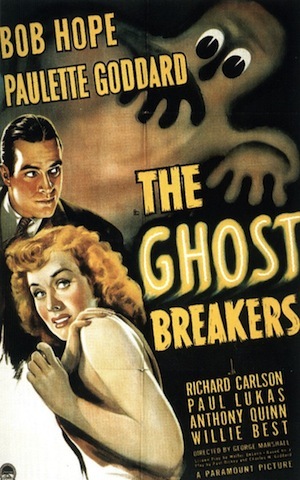 It’s the direct spawn of Bob Hope’s 1942 comedy THE GHOST BREAKERS and the Bowery Boys’ 1946 farce SPOOK BUSTERS. GHOSTBUSTERS sports one of the great comic screenplays. Tightly constructed, it never spins wildly out of control the way that Aykroyd’s THE BLUES BROTHERS (1980) does, but his flights of fancy elevate the reality-based comedy that his co-writer Harold Ramis frequently deals in. Ramis grounds Aykroyd, while Aykroyd provides Ramis with an excuse to play in a more fantastic milieu. And the entire process is aided by Murray’s keen sense of improvisational skills in performance. Tonally speaking, the movie is probably closest to director Ivan Reitman’s previous collaboration with Bill Murray and Harold Ramis, STRIPES (1981). Like that film, GHOSTBUSTERS is primarily centered on the semi-improvised performance of Murray and the comic chemistry of the team around him. Bill Murray examines a possessed Sigourney Weaver in GHOSTBUSTERS (Columbia Pictures, 1984). The downside to this approach is that brilliant comic actors like Harold Ramis and Dan Aykroyd get overshadowed by Murray’s dominating presence (Ramis, as the deadpan Egon, makes a more lasting impression than Aykroyd), but they work solidly as a team in support of—and providing the necessary “straight man” grounding for—Murray’s performance. And without their sense of camaraderie, the whole film would likely fall apart. Standing out and holding their own against Murray, though, are Rick Moranis and Sigourney Weaver. Moranis deftly works his nebbish character (honed in his days at SCTV and given a more sympathetic treatment in 1986’s LITTLE SHOP OF HORRORS) against type as Louis becomes possessed by Vinz Clortho, and makes it seem just through the physicality of his acting as if his tiny frame is an ill-fitting suit for some huge and monstrous beast. Sigourney Weaver likewise plays dual roles strongly—both as the independent musician who is simultaneously repelled and attracted by Peter Venkman’s overtures, and as possessed by the…erm…extremely sexually agressive Zuul. Visually, the movie is BIG. There are great practical, animation and optical effects on display throughout. The sets are amazing, ranging from the humble firehouse location to the climactic skyscraper rooftop extravaganza designed for Gozer’s arrival. Miniature work and puppetry are handled expertly. The cinematography by László Kovács (veteran of CLOSE ENCOUNTERS OF THE THIRD KIND  and THE INCREDIBLY STRANGE CREATURES WHO STOPPED LIVING AND BECAME MIXED-UP ZOMBIES ) is gorgeous. 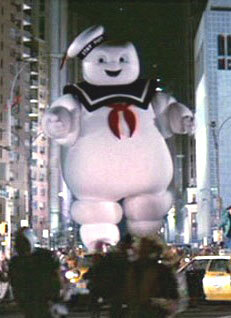 A haunted supersized Stay-Puft Marshmallow Man terrorizes Manhattan in GHOSTBUSTERS (Columbia Pictures, 1984). And then, we have to mention the soundtrack. Not only is the score by Elmer Bernstein (THE MAGNIFICENT SEVEN , TO KILL A MOCKINGBIRD ) among his best, Ray Parker, Jr.’s title song has proven to be as endlessly quotable as the movie itself. Even if you’ve never seen the movie (and I’m speaking to all 12 of you who haven’t), you likely recognize “Who you gonna call?” and “I ain’t afraid of no ghosts!” instantly. What I’m trying to say, people, is that this is one of those nearly perfect comedies. The whole thing works like, well, gangbusters. It’s constantly fun, consistently hilarious and incredibly engaging. There’s not a down moment in the movie, not a minute where it lags. If it’s not a Grand Statement by one of cinema’s great auteurs, it’s a masterfully-crafted piece of pop entertainment. And sometimes, that’s all that’s called for.